Meditating upon these aspects, AzhwAr thinks “emperumAn who can manage contrary aspects in this manner, can unite us who are nithyasamsAris (eternally suffering souls in material realm) with nithyasUris (eternally free souls in spiritual realm)”, meditates upon his ability to bestow the results and instructs others as seen by him. The preceptors mercifully explain “the one who took up a very humble position is [not any ordinary person, but] sarvESvaran himself”. That is – AzhwAr is mercifully elaborating emperumAn‘s supremacy which is cited in “yAvaiyum yAvarum pizhaiyAmal – piNakki” (mixing with everything without missing any sentient and insentient entities). nanjIyar mercifully explains “bhattar would mercifully explain this with a difference” [i.e., though this decad talks about emperumAn‘s supremacy, it is specifically addressing the concept of holding together contrary entities]. That is – AzhwAr becoming amazed thinking how emperumAn united with him who said “I won’t unite with you”. His efforts are many in this uniting; first, when AzhwAr remained ignorant about self and bhagavAn, emperumAn revealed those to AzhwAr and accepted him [this was in thiruvAimozhi 1.1.1]; when AzhwAr entered emperumAn’s proximity, he started thinking about the lowly nature of self and emperumAn’s greatness and tried to leave saying “we are unqualified to be with emperumAn”, emperumAn manifested his great attachment for AzhwAr and accepted him [this was in thiruvAimozhi 1.5]; here, the situation is unlike those previous ones; this cannot be solved easily. Here, if he leaves, he will be blamed; and if he comes closer, he will be blamed too! If one cites a jAthi chaNdALa (born and raised as a dog-eater – i.e., one with very lowly conduct), he can perform atonement [to be relieved of the sins]; but if one cites a praNaya aparAdha chaNdALa (one who has become a chaNdALa, having committed offense towards his lover and has thus fallen), there is no atonement that will relieve him from the sin [Though it may look strange that AzhwAr appears to be blaming emperumAn, this is explained in arumpadham clearly. AzhwAr is really damning himself. That is, the anger which he acquired due to separation, led to sins (as anger leads to sin), which belongs to AzhwAr. Thus, AzhwAr is saying that there is no atonment for his sin which he acquired due to the anger towards emperumAn]. Thus, emperumAn eliminated AzhwAr’s anger by manifesting his great love towards AzhwAr and accepted him, and AzhwAr became amazed at that. emperumAn tells such AzhwAr “This is not the limit for my amazing aspects; you observe that I am united with many contrary entities; hence, no one can remain separated from me!” and manifests his virudhdha vibhUthikathvam (his being together with contrary aspects). 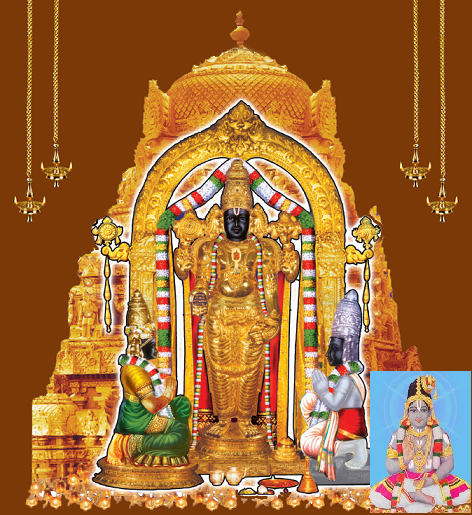 And moreover, AzhwAr meditates upon his qualities such as saundharyam (beauty), Seelam (simplicity) etc and thinks “such sarvESvaran who is the benefactor, descended to thiruviNNagar and manifested his presence here”. He says with finality “there is no higher relative than he for us” and explains “there is nothing other than his divine feet which is our refuge”. After enjoying his supremacy in thiruvAimozhi 1.1, AzhwAr fell unconscious thinking “eththiRam” (how is this possible) in thiruvAimozhi 1.3. Here, he first meditated upon emperumAn‘s simplicity of not leaving him even after he said “pOgu nambI” (Oh complete lord! Go! ), and now enjoying the supremacy which is opposite of simplicity; as AzhwAr was divinely blessed with unblemished knowledge and devotion, his meditation upon emperumAn’s supremacy and simplicity are the same. This entry was posted in thiruvAimozhi, thiruvAimozhi 6th centum on November 18, 2017 by Sarathy Thothathri.